Enjoy Soft Healthy Skin When You Use Goat Milk Soap! Welcome to Debbie Sue's Goat Milk Soap! 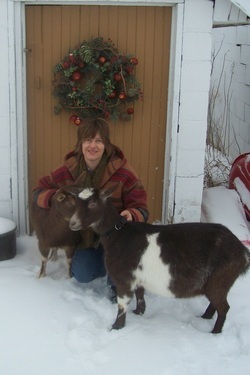 I'm Debbie and these are my goats, Vicki and Jubi. I have Vicki's daughter, Little Anne Petunia too. They produce the lovely creamy milk that I use to make the soap. I add herbs and natural products to my soaps to make them look and smell the best. Go to the Soaps page to learn more! This is my husband John, my son Johnny and Me.